Sean Kelly on winning the 2017-18 CSL title! 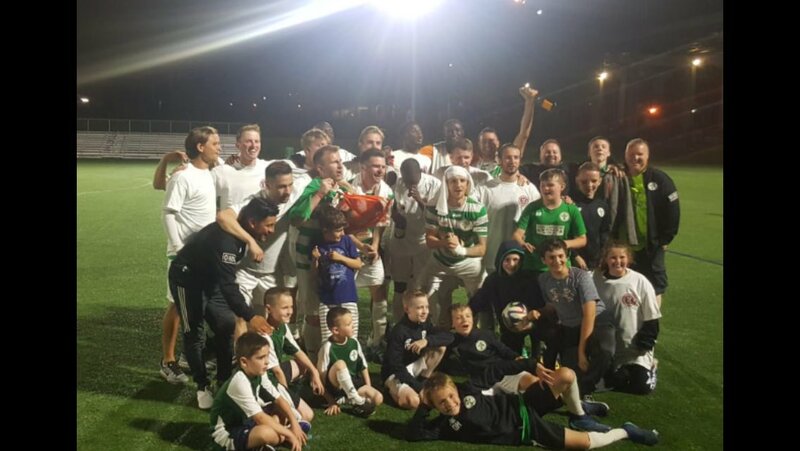 You might want to get to the end of this piece, Lansdowne Bhoys captain Sean Kelly expressed how happy he is to win the 2017-18 CSL title even though “it didn’t feel like a final” and… shared his view on his side’s controversial 90th minute penalty kick, which he converted to send the game to penalties. It wasn’t as pretty as their previous 3-0 and 2-0 victories in the CSL final, in fact it was one of the most bizarre final you will see at any level, the league’s top scorer was playing keeper, controversial calls were thrown left and right but at the end of the day Lansdowne Bhoys are the 2017-18 CSL champions as they got the best out of Cedar Stars Academy 4-2 in penalties after a 1-1 draw. One of the many talking points of the final is Lansdowne’s 90th minute questionable penalty kick, which you could argue ultimately snatched the CSL title from the Stars. Lansdowne striker Ovan Oakley, one of the best forward the league has seen in the past four years, drew the PK from a soft challenge in the box. “They [Cedar Stars] were literally 30 seconds away from winning the CSL,” the Bhoys' captain Sean Kelly said. “But that’s the call the ref made we can’t argue with it, we’ve had calls go against us in the past. Lansdowne lost in the semis last year just a season after their historical threepeat, Kelly is thrilled his side regained their title of CSL champions. “It’s amazing just to win the league back again,” Kelly said. “Letting it go last year wasn’t a good feeling ‘cause we won three in a roll then to lose in the semifinal was a bit strange, thankfully the nationals [Fritz Marth National Amateur Cup and Werner Fricker Cup] made up for it. Before the final, Lansdowne played their least successful regular season in seven years, finishing in third place via a 13-3-2 record and were knocked out of the Amateur Cup and the Fricker Cup in the local stages. While the Stars put up the second most dominating season in the modern era of the CSL, topping the league with a 14-1-3 record while scoring a record breaking of 68 goals. Kelly is delighted that his side still managed to lift the trophy after a bumpy season by defeating a redoubtable Cedar Stars team, that he wasn’t shy to praise. “It’s been a long tough year,” the 30-year-old captain said. “We came in 2018 we weren’t playing well. Last time we played them [Cedar Stars] they beat us three-nil, which I just want to mention Cedar Stars is a fantastic team, they’re the best team we’ve seen in a long time, they pushed us to try to get better and better. CSA played most of the match without their starting keeper Bryan Lopez as he exited the game in the seventh minute after picking up a concussion on a collision with Lansdowne’s top scorer Ovan Oakley. Lopez conceded the least goals during the regular season, 12, and set the record for the longest consecutive clean sheets, not getting scored on in 10 consecutive matches. CSA’s captain and league top scorer Christopher Katona stepped up in the net after Lopez’s injury. Despite missing their number one scorer and first choice keeper, the Stars struck first as Michael Olla netted a semi bicycle kick from the top of the box after lifting the ball up to himself. 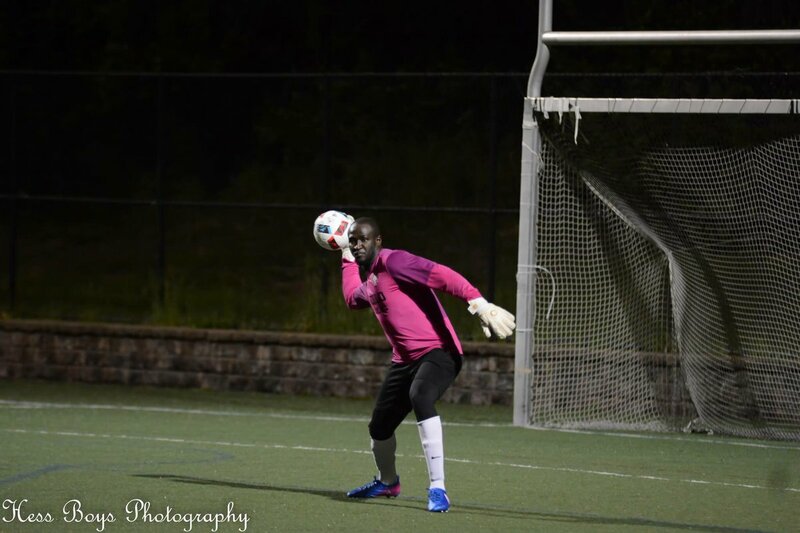 Seven minutes inside the second half Lansdowne keeper Abdoukarim “Kabo” Danso palmed Walter Calderon’s shot away outside of the box. The CSA players and coaches screamed for a red card but the referee, of course Lansdowne’s coaches, thought it was a yellow. The last controversial call of the match was perhaps the most crucial one: the 90th minute penalty kick aforementioned. PK or not, captain Kelly was ready to strike from 12 yards. “90th minute, I’m the captain, I’m going to step up […] I knew I wasn’t going to miss,” Kelly said. Indeed the ex-Arsenal youth player did convert the penalty, sending the final into a penalty shootout. Lansdowne bested Oliver Papraniku’s men in the shooutout, 4-2. The Irish club’s scorers were Kelly, Janos Lobe, Thomas Wharf and Michael Holzer. As for CSA, Martin Lukaschik and Dilly Duka scored but Chris Riordan and Samuel Gehman couldn’t find the net from the spot. The 2017-18 CSL title is Lansdowne’s fourth one in five years. Kelly was a member of the club for every single one of them. Despite all the wonders of this final, the center back shared that this CSL title is his second favorite one because the club overcame a rough season and bounced back from last year’s trophyless CSL campaign. “Apart from the first one this is my favorite [CSL title] to get the league back again,” he said. Kelly later added: “We were very late starting this year and obviously it showed against the team we played but we never lost it, we never lost faith in ourselves, we always knew we were the best team in New York. We always knew it, we always believed it and tonight we had to show it against a very good Cedar Stars team.